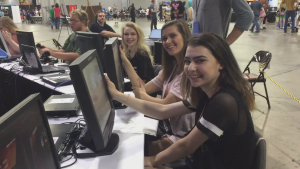 The LTE Bridge was at the the MoMoCon 2017 gaming track, May 25 thru 28th, 2017. 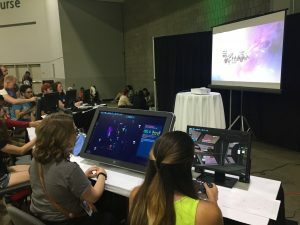 We deployed out Dreadnaught scale Artemis Spaceship Bridge Simulator experience with DMX lighting, touchscreen controls, and 30 minute missions for up to 8 players. Not only was this our first MomoCon, but it was our first Artemis event on a “shared space” in a convention hall. This presented some unique challenges for our team, so creative screen and light positioning were implemented to ensure we could provide the best possible Artemis experience. We’re already making plans for next year, including a possible partnership with the LARP track. Full immersion bridge set with lighting, staging, and a GM-led script anyone? Let’s bring a true “room-scale” experience!